Upgrade to TREAT 3.5 Today! To download the TREAT 3.5 installer, complete and submit the form below. The upgrade requires an active TREAT support license. If your TREAT support license has expired, you can visit the TREAT store to purchase an upgrade/support license that’s valid for a year. You’ve purchased TREAT within the last year. You’ve purchased a TREAT support renewal within the last year. Set Default Financial Terms in the TREAT Preferences. We’ve added new LED lighting options in the lighting library! Hydronic Distribution Systems now default with the correct piping area. Inspections and measurements are now connected explicitly to an assembly (either the base building or a package) and do not rely on dates matching. Inspection and measurement wizards default to no inspections or measurements selected. Improved detection of basements – conditioned spaces with only short walls adjacent to ground will not be detected as basements. *** Changed the way TREAT handles HVAC improvements – it is now possible to correctly model a heating plant upgrade, cooling plant upgrade and distribution insulation in one package. Added Temperature Initiated Shower Flow Valves to Water Fixture Details. These are for reporting only and do not affect energy modeling. Appliances can now be marked as ‘Exterior’ matching the behavior for lighting. Detailed data collection for pool pumps. Details are for reporting only and do not affect energy modeling. Health and safety now present on non-audit packages as well as audit. Health and safety measurements and inspections are associated with a package based on date. The New York Home Performance Report has been updated and moved. 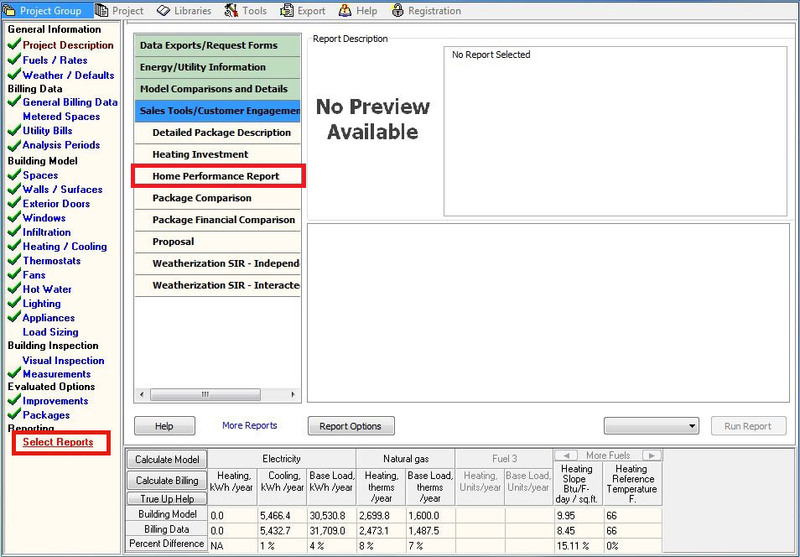 To access this report select “Select Reports” on the left navigation bar in TREAT. Click on the “Sales Tools/Customer Engagement” reports and select “Home Performance Report” to access this newly stylized report. Please note that the base building and improvement packages need to be calculated first in order to run the report. This document lists all of the required non-energy modeling related inputs required for TREAT files to be submitted to state programs including New York Home Performance with Energy Star and California Energy Upgrade California: Home Energy Upgrade. When modeling for these programs please be sure to follow the guidelines attached above. Please submit the form below to download TREAT software.